At first glance, a long, narrow room is not too comfortable for life. However, choosing the right environment can make it quite cozy. This room is ideal for zoning – no problem, you place in this living room, office and even bedroom. Most often in the long room there is one window located on the front wall. The far corner of the room is left without light of day. This disadvantage can be turned into advantage, turning it into the far side of the room, a mini-bedroom. Set at the end wall, opposite the window, the bed. If there is a place nearby you can mount built-in wardrobe. The wall above the bed, make shelves on which to place pictures, posters and other decor items. From the main part of the room is fenced off bedroom sliding curtains on the ceiling cornice or narrow through the rack. If you want to equip in the room the Cabinet, throw it in the brightest part of the room, by the window. Area office is fenced off from the rest of the space with a transparent curtain of tulle, organza or silk cords. When furnishing a narrow room, place the furniture along the walls, it will lengthen and reduce the room. Choose custom headset uneven, add their shelves. Try to break up the vertical, placing furniture across the room. For example, arrange in the center of the room, the relaxation area is a small sofa, pair of armchairs or banquettes, plus a coffee table. 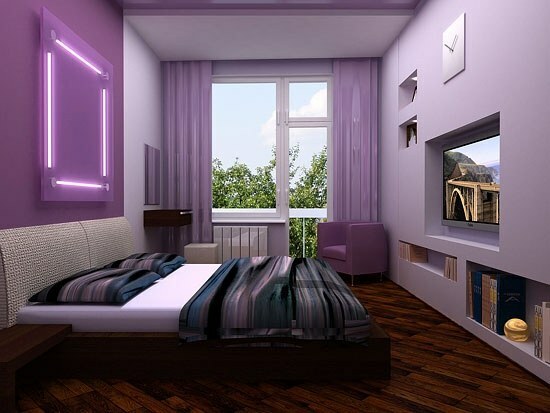 Choosing the color of the walls and ceilings, will focus on bright colours, as if to blur the boundaries of the room. Visually narrow the space help window curtains in a contrasting color. Attach the cornice as high as possible, curtains should be long, to the floor or even below. Beautifully drape the ends of the curtains on the floor. Decorated so the window will visually shorten the room and make the ceiling higher. Experiment with lighting. The chandelier in the center of the ceiling is not the best solution. To satisfy the long room light, mix and match spotlights, sconces, floor lamps, table lamps. Do not place them in strict geometrical order. Your task is to break the space to escape from unnecessary Parallels. Zonirovat room will help and flooring. If your room is big you can put two types of coverage – for example, a laminate of different colours or parquet with different pattern. In a small room you can lay the carpet, highlighting their area.